\nSo I\'ve wanted a lightweight 6x12 for a hiking trip I\'m taking to Norway coming up. After lots of work, I\'ve gotten most of the items sorted and I took ahold of my first printed prototype. The printing process used is laser sintering. I\'ve found the resolution to be superb (granular to below 0.3mm) and it\'s also very strong (for items printed with a thickness of over 2mm). \nMy main concern now is testing it to produce consistent results. \nI\'d like to solicit some help with what and how to test. Testing is incredibly difficult. You\'ve really got to be systematic and rigorous. I\'d love feedback and criticism. \nMy general philosophy here has been to use a longer lens, shooting at a short focal length and a fast aperture. Overall the goal is to have a very narrow DoF so that you can measure how far off you are. \nI shot some preliminary shots and I could see that @ infinity, many of the items in front were in focus but infinite was not, so I knew that the lens to focal plane distance was too long. \nMy first real test - shoot a subject measured @ 8 feet away using my Mamiya Press 150mm F5.6. I setup a table with a black box against a white background (the box is an empty 4x5 box ). Then have a tape measure on its side. Have little black items mark each half foot in front of the black box. Shoot the first shot at 8 feet (which, if everything is perfect, then the black box should be in focus). Then focus the lens @ 9 feet. Then 10. Then 15. \nHere\'s the first shot with the lens focused at 8 feet. \nHere\'s the second shot at 9 feet. \nI also shot with the lens at 10 feet and it\'s now out of focus. \n1) Where the lens meets the body. \n2) Where the horseman back meets the body. \n3) The plastic that is being printed is porous. It looks black on the outside, but the inside is white (Shapeways paints it black for me). Direct sunlight could simply penetrate the body itself. \nSo I\'ve come up with some a way of taping over certain parts, to potentially isolate where light is coming in. From my early photos, I can\'t detect any light leaks, which is good thing. I ran some more rigorous tests to isolate these, but every frame came out 100% overexposed (even when covering up the cracks from places #1 & #2 with gaffer\'s tape). So I suspect that place #3 is at play here. \nI\'ll have to cover the entire body with gaffers tape to see what happens and if I\'ve missed something. This is pretty disappointing though (just got the film back a couple of minutes ago). I suppose it\'s noteworthy that this only really happens in direct sunlight. Indirect sunlight won\'t do this. \n2) Cover it in some other material. \n3) Add flocking (something I plan on doing) to the inside. \nOverall it feels really solid. I designed an Arca swiss style plate into the body to act as a "foot" on the front so that it doesn\'t fall over and I can attach it to my ballhead. This is working well but it\'s a bit flimsy at the corners of the baseplate. I\'ve redesigned and beefed up the mounts from the baseplate to the body. \nI put a bubble level on the cold shoe and found that it wasn\'t dead center (using the bubble level on my tripod for that). What I think is happening is that the graflok style back is pushing up against the cold shot and flexing it (pointing it downward). I\'ve changed that in my design. The good news is that when I put the bubble levels on the lens and on the back, they match, so I feel more confident that the film plane and the lens are perpendicular. \nThanks for the reading! If there are other methods of testing I should be doing, please let me know. Can\'t offer any suggestions or remedies, but just wanted to say that I\'m really impressed with your camera! That\'s a very cool project. Best of luck with your camera and upcoming trip! \nMany thanks! I\'ll keep the thread updated with new tests! \nExcellent idea. Probably will look a lot better than the gaffers tape (if used on the outside). But I do plan on flocking the inside and that will most likely significantly reduce the light leaks. Great project. I\'d recommend moving the tape measure a bit closer to the center of the field of view, because some of these lenses can have field curvature near the edge, meaning if you calibrate focus on the edge, the center may be a bit off. \nFrom my pinhole camera experience, anything shiny, black or not, will reflect bright sun. Craft stores have adhesive black felt, in sheets, that works good as flocking. \nKeep us update on your progress. Well done. \r\n	"If your eye is clear, your whole body will be full of light"
\nThanks. Yea that tape measure is in the photo only for reference, it\'s not what I used to measure the distance from the film plane to the subject (I used the tape measure directly from the camera to the box I was focusing on). \nGood idea with the flocking, I ordered some from Prophoto. Looking forward to the next iteration and seeing what the flocking does for the shots. I\'d love to help with this project if you\'re interested, in terms of the printing. Message me if this is of interest. \nI\'d start by trying to measure the register distance. Put the camera on something flat, remove the lens and measure from the lens seat to the film. Measure at several points around the circumference and compare to what a Mamiya Press should have. My experience with 3D print is that it isn\'t very precise not very flat/perpendicular. \nFirst correct that and then use some paint/coating/flocking at the inside to make it lightproof. \r\nI\'d start by trying to measure the register distance. Put the camera on something flat, remove the lens and measure from the lens seat to the film. Measure at several points around the circumference and compare to what a Mamiya Press should have. My experience with 3D print is that it isn\'t very precise not very flat/perpendicular. I also made some test shots with my 150 5.6 (again using a very thin DoF to show exactly where the focal points are) and it\'s sharp across the negative. I should be good here. Note sure if I should release it in the current iteration or work on a better, Version 2.0 that is all printed with separate parts. I\'m still thinking about how I could potentially work this out. But I appreciate the enthusiasm! \r\nI don\'t doubt this eats film, try feeding a 6x17. But I do have a 6x12 back, a Mamiya 50 but I\'m missing something in between. Got it? So I\'ve tested through a lot of the issues and I think Ive nabbed them all. \nI added some flocking and it helped tremendously. Things are looking great. Here are some shots from Cape Cod on the beach and the Providence RI Amtrak train station. (BTW - I switched to the Mamiya Press 75mm lens instead of the 50 6.3. The 50 will vignette slightly but not the 75mm). \r\nThis puppy eats film like there\'s no tomorrow. But the results are definitely worth it. Kudos to you for this amazing project! I\'ll keep my fingers crossed for you. \r\nMain Lenses: Leica, Nikkor, Voigtländer, Meyer, Fuji, Sigma, Pentax, Tamron, Rokkor etc. \nWhat name will you give your camera? \nMany thanks for the kind comments from you and Kent! \nI christen her, The Cristina 612. The wife\'s moniker is the most important, in all lines of business. \nI don\'t doubt this eats film, try feeding a 6x17. But I do have a 6x12 back, a Mamiya 50 but I\'m missing something in between. Got it? \nI added flocking and a load of gaffers tape to the outside to keep out the light. I\'m currently in talks to print it out of another material so the gaffers tape on the outside isn\'t needed. The Flocking I think is needed regardless, to reduce the internal glare and deepen contrast. \nIs your back a Dayi or Horseman? \nAlso the 50mm vignettes somewhat (slightly) but I think it adds character. The 75 covers it fully. But you couldn\'t go wrong with either lens. Both are super, IMHO. It\'s a Sinar Zoom back. Can do 6x4.5, 6x6, 6x7, 6x9 and 6x12. I thought of coupling it to a Fuji SWD 75 but I have no idea for focussing. But the Mamiya Press lenses do have a helix build-in so that might be a better option. Doesn\'t surprise me there is some vignetting, they were intended for 6x9. Maybe the ones for the Polaroid version might be better, they do have a larger image circle IIRC. Can your Sinar Zoom switch between 645, 6x7, 6x9 and 6x12 mid-roll? Or is each roll devoted to a single size? I could of course work to develop a back to fit the Zoom but it would take some time and I\'d need an example of one to work with, iterate on etc. \r\nThe Mamiya lenses for the Polaroid 600SE do have a larger image circle because they were designed to cover the pack film (FP3000 and FP100 which are sadly no longer made). The three lenses designed for the Polaroid were the 75mm, 127mm and the 150mm. The 75mm covers the 6x12 and 4x5 fully. The 150mm vignettes on both (I\'ve tested it). I\'ve yet to try the 127mm but I suspect vignetting. \r\nOf course, having a helicoid is really useful as you can imagine. There are some 4x5 lens helicoids on the bay but I\'d bet they are shoddy construction (aluminum). \nResults look outstanding. Keep going with it. Push the envelope. \r\nResults look outstanding. Keep going with it. Push the envelope. \nThe two biggest issues: leaving the dark slide in and forgetting I was not focused at infinity. The first issue can be taken care of by removing the darkslide completely. The second just takes diligence. I\'ve started work on a new design. \nI began to notice that some of my images have darkening in the corners and some don\'t which confounded me. I realized though, that it\'s the faster apertures causing the vignetting. I am also seeing what appears to be a light leak as well, but it\'s unlike other light leaks that I\'ve seen in the sense that it\'s only on one or a few photos. \r\nI looked through a strip of contiguous shots and out of the 6 shots, it\'s really prevalent on one shot but not the rest. So I am at a loss for an explanation there. Lost track of this thread when it was moved. Have to say there are some great images in it. Really, this is a lens that is underrrated so much it isn\'t funny. Well, it kind of is funny for us who have one and use it. I really have to use it more, it is a lens that performs so far out of its zone. \nNow the vignetting... it is noticable, but on the other hand it doesn\'t bother me. \nYou got Norway captured like I remember it from 40 years ago. Wiiiiiiide landscapes, empty, lonely, wild and raw. Gorgeous. \nThanks! Yep, Norway is still incredibly beautiful. Quite possibly one of the best places to hike/camp I\'ve ever been. \nAnd yes, the 75mm super Angulon is a beast of a performer. While there is vignetting, it\'s only at wider apertures. At f16 or above, it seems imperceptible. \n400 iso film in direct sunshine is needed. You need to shoot at 1/250 or faster to make things really sharp if using handheld. Portra 400 is perfect. So 1/250 @ F22 seems to be the sweet spot. \nI really wish I had a back that fit your Sinar Zoom. I only have one which will fit the Dayi/Horseman backs, at this point. \nI want a 6X12. I have been shooting Mamiya Press and MF Fuji for years. \nAre you going to market this, or market the 3D files????? Please let me know. I am set on the lenses and backs. \r\nI want a 6X12. I have been shooting Mamiya Press and MF Fuji for years. \r\nAre you going to market this, or market the 3D files????? Please let me know. I am set on the lenses and backs. \nI simply must replace this monster with a 6X12 that uses my Mamiya Press lenses. I may make a mask to use my 65mm, and I may get a 50. I may put my 100 f2.8 on and mask as well. Could you explain a bit more about why you\'d like a mask? You mean shoot 6x12 with the 65mm or 50mm and then mask the film? I\'d recommend shooting the whole frame and then cropping if needed. Or, if you want to shoot 6x9, you could also get a Horseman 6x9 back (made for 4x5s). They are less than $100 and are great. \r\nMay never happen, and don\'t want to throw out considerations that may hinder your plans and progress. Forget I said it. \r\nI\'ve been doing a lot of stuff with cutting down Polaroid Pathfinders, and slowed to a standstill on that. Have one cut down to the base rear plane, bellows, and repositioned front standards to maintain the parallel aspects of the front to back. 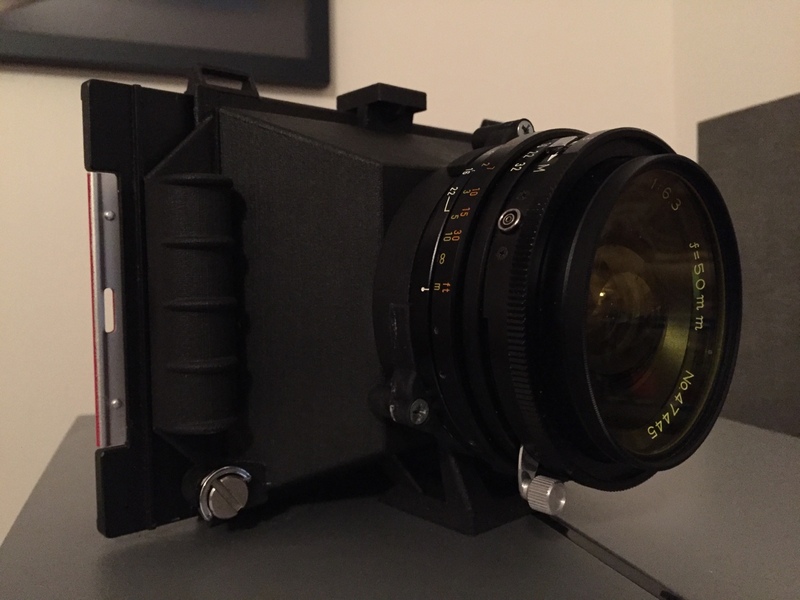 I extended the back to flare out to 4X5 inch, and yet keep the square of the Graflex Crown Graflok back. But enough of that. \n2) handles which can fit a plunger type cable release. \nThe best part about the lens cones is that I can print cones for any LF lens and set it at infinite. \nI still have more work to do though. \n1) I\'m replacing the screws I am using for the lens holder with thumbscrews. I can\'t help with any of the technicals, but I will certainly express my admiration for your skill and initiative and creativity. All the best with it! Thanks, John. It was definitely and obsession of mine. In fact, tweaking, adding, subtracting is an addiction, even to this day. I just wanna work on it, it seems. And every iteration, I find that I can do things better, different. \r\n1) Make the lens cone narrower (there\'s lots of extra space inside). \r\n2) Print the lens cone, back and adapter that mates with the 120 back all separate (and have holes to screw them together). With separate parts, it\'s easier to add flocking. And flocking is incredibly important, for lots of reasons. \r\nI suspect a V 2.0 will be worked on soon.